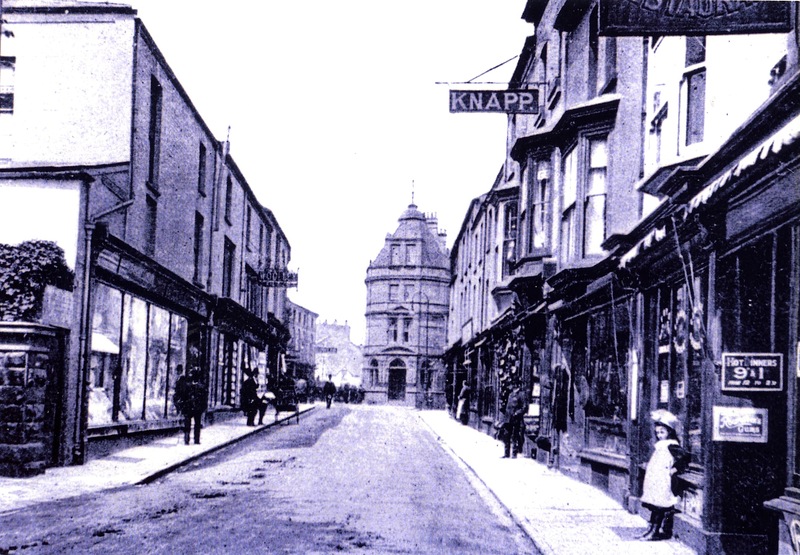 When I lived in Pontypool during the 1930s and 1940s the shopping centres of most towns, large and small, were roughly somewhere in the middle of the town. There were no “trading estates” on the outskirts of towns. Most people wouldn’t have had a car to reach them if there had been. Shopping was a more cohesive experience in that everything you wanted you could usually get in some shop or other in the town centre. On the other hand shopping was not an all encompassing experience so that you could get almost everything you required in one shop as in today’s supermarkets. So my theme for today’s photographs is Pontypool town centre shops etc in Commercial Street and Crane Street. 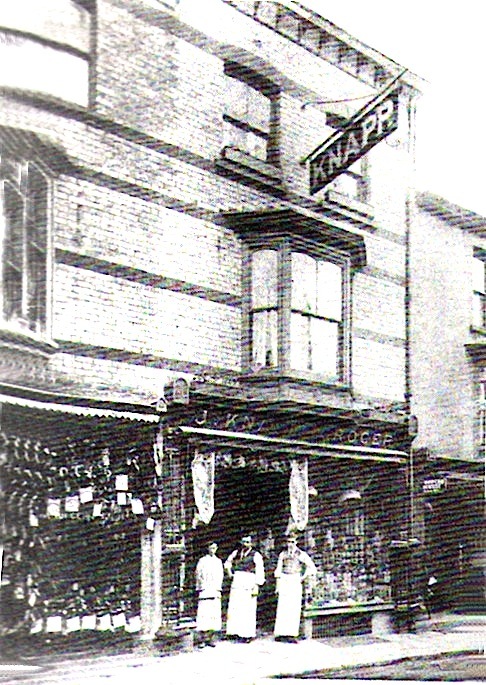 This looks like a very old photograph of the grocery shop of Mr J.Knapp. 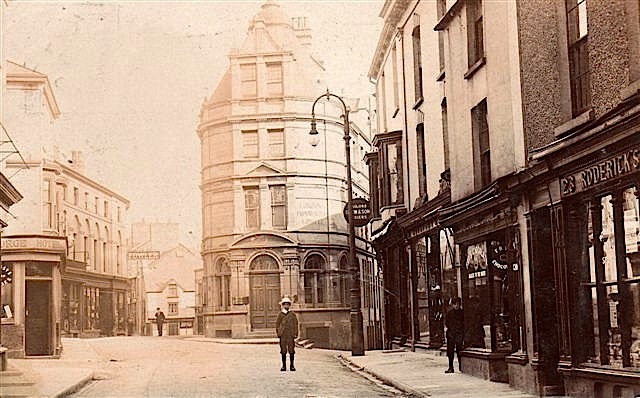 This was in Commercial Street and can be seen in the third photograph. Presumably that is Mr Knapp and his two assistants standing in the doorway. Flanked on either side and slightly above them there appears to be two sides of pork. Judging by the clothes on the young man in the centre of the photograph and the sepia toning of the print, this too is a very old photograph. 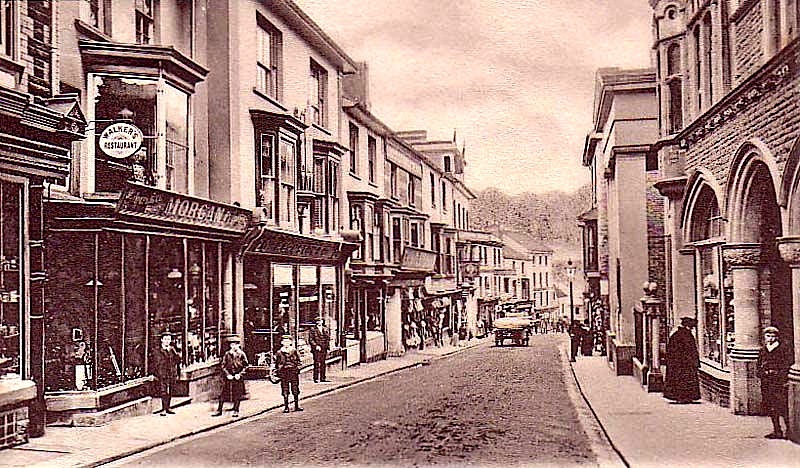 This photograph shows a longer stretch of Commercial Street. I should say it’s slightly later than the photograph above but is still quite old. Mr Knapp’s grocery shop is in evidence though, of course, we don’t know whether Mr Knapp himself was still running it or whether one of his young assistants might have taken over. The attire of the boys and the lady in black seem to indicate a photograph more or less contemporary with the second photograph above. On the left we can clearly see the sign for Walker’s Restaurant and the sign above Morgan’s shop. The young boy on the right is standing outside the top entrance to the market. 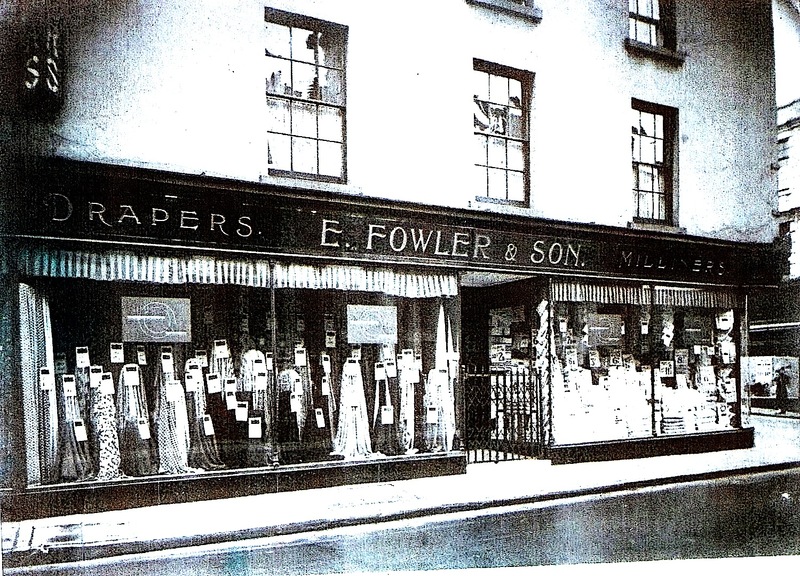 This shop was always referred to as “Bottom” Fowler’s because around the corner and higher up in Crane Street there was a “Top” Fowler’s. I went into this shop with my mother on many occasions and the thing that really fascinated me was the overhead wire which carried all the money flying to a central cashier who put any necessary change in the container and sent it back for the customer. Farthings were in use in those days and Fowler’s were very fond of putting up prices which were just one farthing short of the shilling; such prices as “one-and-eleven-three-farthings” which was only one farthing less than two shillings. For the sake of any visitors under the age of 40, perhaps I should explain that there were 4 farthings in a penny, 12 pennies in a shilling and 20 shillings in a pound. This entry was posted on March 29, 2011 at 11:00 am and is filed under information, Places around Pontypool, Scenery. You can follow any responses to this entry through the RSS 2.0 feed. You can leave a response, or trackback from your own site.